My family and I absolutely love to hit the great outdoors after a long winter. We’re ecstatic about our new addition: an outdoor shower!!! Conveniently, we’ve set it up just outside our RV. The tankless water heater gives us the luxury to enjoy the summer sounds and a hot shower at the same time! A tankless water heater is an innovative way to save energy. It doesn’t use energy to keep water heated in a holding tank. Rather, these water heaters only heat water on demand--which means when the water is turned on. If you have a gas water heater instead of an electrical heater, you can save extensively on your heating bill. Additionally, these little units are highly efficient with their propane usage. A portable tankless water heater has a unique compact design which uses considerably less storage space than a conventional hot water tank. When choosing a tankless water heater that’s right for you, you’ll want to consider a few things. First, determine how much GPM your shower or other points of use produce. If you wish to send water to multiple points of use, calculate the total amount of GPM needed to supply your water outlets. For example, if you wish to supply only the shower with hot water and it uses 2 GPM, then look for a unit that produces a minimum of 2 GPM. Secondly, subtract the temperature of the groundwater at your location and the desired water temperature. Typically, a comfortable shower temperature is at 120 degrees F. If the groundwater is at 62 degrees F, your water heater should be able to warm up water with a temperature rise of 58 degrees F.
Review the GPM guide and groundwater temperature map here. What you may not know is that your tankless water heater heats water according to the flow rate. If you live in a climate with groundwater of cooler temperatures, you’ll need a larger unit water heater with a greater flow rate in order for it to produce your desired temperatures. Manufacturers advise consumers to hire professionals to install their newly-purchased water heater. If the unit isn’t set up properly, the escaping gas leaks can cause severe damage to the unit or even alarmingly catch on fire. If your jurisdiction allows for homeowners to set up their own water heaters and you do decide to install it yourself, be sure to follow the manual’s set-up instructions very carefully. See video below for a visual of the Gas Leak Test. Can You Install a Portable Water Heater Indoors? Since many users prefer the convenience of having the unit installed indoors, this is a frequently asked question. Yes, it’s possible to install inside IF it’s vented properly. Since portable water heaters are manufactured for outdoor use, no ventilation is required when set up outside. Propane water heaters emit carbon monoxide and thus cause concern for the safety of humans and animals. Manufacturers advise to install a flue pipe or a duct to ensure proper ventilation and a safe indoor environment. And with newer designs of ventilation ducts, you don’t have to sacrifice beauty for safety. You can lear more facts about venting tankless water heaters here. Since the portable gas tankless water heater has a little ignition flame, you will want to set up your water heater out of direct wind or even away from drafts. Some units are more particular than others; but in general, these need to be set up free of wind exposure to prevent the flame from extinguishing. These little units can get severely hot. It’s advised to install a protective metal heat shield on the mounting wall to prevent any danger of fire. The exhaust is very hot. Refrain from placing any items directly on top of the unit. When using or storing in freezing temperatures, drain the unit completely to avoid damage caused by freezing and cracking. Consider removing the batteries for storage or travelling to ensure extra safety. Make sure you use a water pressure regulator. The Eccotemp L10 portable water heater is a light unit that’s easy to carry and mount to a wall. It produces 2.6 GPM of very hot water at 20-80 PSI. It can achieve temperatures from 50--140 degrees F.
This heater easily connects to any standard garden hose with an included garden hose adaptor and the ½ in npt to ¾ in garden hose fitting. It’s also compatible with a 12V water pump. It features a chrome shower head and stainless steel hose which is perfect for hosing down your pets or setting up your outdoor shower. This unit has a safety feature that automatically shuts off when used longer than 20 minutes or tilted more than 45 degrees. It comes with a long LP gas regulator and hose which connects to any standard 20 lb liquid propane tank. Being powered by 2 “D” cell batteries makes this an excellent choice for any off-grid needs. This tankless water heater is lighter than the Eccotemp’s water heater. Weighing only 15 pounds, it’s easily portable and easy to install and use. Its 3.2 GPM makes this unit a favourable choice for anywhere that hot water is needed. Whether it be at campsites or your barns, this unit is activated at a low pressure of 2.9 PSI with a rise of 45 degrees F.
You can connect this water heater easily to a standard RV water hose. It uses 2 “D” cell batteries to power the unit, making this a great choice for saving energy or using it in off-grid settings. These batteries are the power source of the ignition--no pilot light is needed. A fabulous choice for any hot water needs, the Camp Chef Triton produces nearly instant hot water at a rate of 1.5 GPM and a comfortable setting of 25-30 PSI. Its maximum PSI is at 80. This water heater functions great with both a garden hose and a water pump. This unit’s unique feature of self-standing capability makes this an optimal choice for use quite literally anywhere. It includes brackets for you to hang on a wall if you choose to mount it. The carrying handles neatly tuck away for compact storage. The shower head features 4 settings (off, mist, shower, and jet) which is perfect for your outdoor shower at a pool or beach. An 8 ft water hose and a brass garden hose connector is included. When the water is turned on, 2 “D” cell batteries automatically ignite the burner. A regulator hose for a bulk propane tank is included. This rust-proof tankless water heater is easy to install. It produces 3.1 GPM and can be used for multiple points of use. This is an on-demand water heater that can function at low levels of PSI. It has a 5-year warranty. It features temperature knobs that give you the luxury to control the water temperatures. Highly efficient and economical, this unit can save you up to 60% on your electricity bills. If you’re in an area with frequent power outages, this water heater may be a great choice for you since it doesn’t need any electrical connections. One unfortunate part of some of these tankless water heaters in this model is that it’s slightly contradictory of itself. It needs a fair amount of water flow to ignite the on-demand heating cycle. However, the flow rate setting forces you to run the water at 1.0 GPM to produce heated water. Even at this setting, you can be suddenly blasted with cold water because the heater doesn’t recognize the need to heat water above 2.0 GPM. This unit is made cheaply but performs fairly well. If you need a quick solution, this may be for you. This little unit needs a low water pressure of only 2.5 PSI to kick off the water heater. It produces 1.32 GPM at a pressure level ranging from 2.5 PSI to approximately 100 PSI. Its temperature raise ranges from 46.4--114.0 degrees F.
This highly efficient unit can save you up to 50% on your heating costs. It mounts conveniently on the wall of your cabin or shower stall. It’s compatible with a 12V water pump. You can control the heat settings and flow rate to your desired temperatures. The showerhead features an On/Off switch. The included 59-in hose makes this a good option for bathing your animals. Although it has the anti-freezing protection, it’s advised to still drain the unit after use and place in a warm storage area. 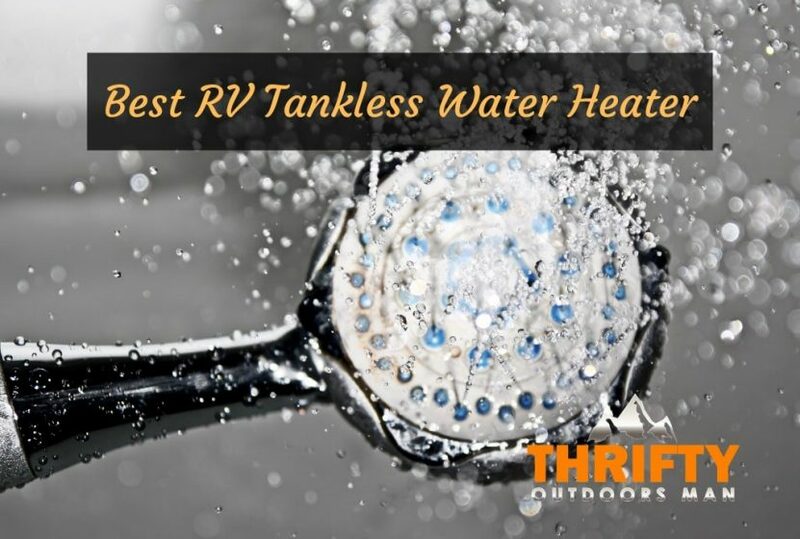 So...Which Tankless RV Water Heater Is Right For You? If you fear the pilot light and prefer to have a water heater without it, the Portable Propane Tankless Water Heater - EZ 202 may be exactly what you’re looking for. This unit promises to deliver hot water at a fair amount of GPM and a low PSI. If you’re looking for something that’s more popular yet inexpensive, you may want to try the Camp Chef HWD5 Triton Water Heater. Besides its quite consistent performance, this water heater has some unique features including its self-standing capability and the 4 settings of the showerhead. Finally, if you’re looking for a tankless water heater that has a history of minor problems and high level of customer satisfaction, you may want to consider the Camplux 5L Outdoor Portable Propane Tankless Water Heater​. You may enjoy the added bonus of the On/Off switch on the showerhead.